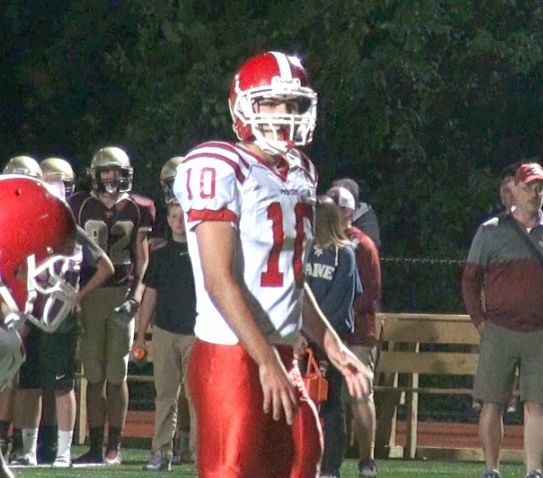 St. John's (Shrewsbury) quarterback Steve Bucciaglia and the Pioneers edged crosstown rival Shrewsbury Friday night. 1. Duxbury (5-0; Last Week – 1) Regional rival Silver Lake gave Duxbury a fight during the first half of their Week 5 tilt, but the Dragons offense exploded once again on their way to a 55-14 victory. 2. Xaverian (4-1; Last Week – 2) With a 28-7 win at Brockton last Friday, the Hawks have now bested the Boxers in 10 of the last 11 meetings between these historic rivals. This victory came with a little extra significance, as it was the 200th win of head coach Charlie Stevenson’s career. 3. Billerica (5-0; Last Week – 3) No let down for the Indians after their emotional comeback win over Everett in Week 4. Billerica bested North Andover, 35-8, to remain undefeated. 4. BC High (4-0; Last Week – 4) The Eagles dispatched Malden Catholic 59-6 this week and are now averaging 44 points per game with a point differential of plus-131 through 4 contests. 5. Everett (3-2; Last Week – 7) The Crimson Tide opened GBL action with a 49-0 drubbing of Metheun, and move up in our poll while other top-ranked teams took losses this weekend. 6. St. John's Prep (3-2; Last Week – 9) New quarterback Mike Yarin appears to be a quick study. He looked very sharp in a 37-27 shootout win over Catholic Memorial and his continued improvement shores up one of the Eagles' few weaknesses. 7. Haverhill (4-1; Last Week – 13) In front of a record-setting crowd, the Hillies put together an impressive all-around performance to down Central Catholic 21-10 and vault into our Top 10. 8. St. John's (Shrewsbury) (4-1; Last Week – 8) It’s a war every time St. John’s and crosstown rival Shrewsbury meet, and their 38-35 shootout in Week 5 was no exception. 9. Central Catholic (3-1; Last Week – 5) It’s hard to fault the Raiders for stumbling in a raucous environment at Haverhill last Friday. They’re still one of the most complete teams in the state, and a favorite in D1 North. 10. King Philip (5-0; Last Week – 10) Nothing fancy about the Warriors fifth win of the season, as they simply outclassed Franklin a 35-12 victory. 11. Dartmouth (5-0; Last Week – 16) With all the talk about what the Indians lost on offense this year, we seem to have overlooked their stacked defense, which proved to be the difference in a 13-6 win at Bridgewater-Raynham last Friday. 12. Andover (3-2; Last Week – 12) The offense has looked sharp during Andover’s three-game winning streak and the defense has played well enough. The Golden Warriors will need to fire on all cylinders in upcoming matchups against Haverhill and Central Catholic. 13. Bridgewater-Raynham (3-2; Last Week – 6) The Trojans couldn’t jump start their trademark rushing attack, or stop dual threat quarterback Cole Jacobsen during their first loss to Dartmouth since 2008. 14. Springfield Central (3-2; Last Week – 14) After suffering a surprising 6-0 loss to Longmeadow on a rain-soaked evening two weeks ago, the Golden Eagles got back on track with a 49-7 beat down of Holyoke. 15. Tewksbury (5-0; Last Week – 15) Close call for the Redmen in a 20-18 win over Lawrence this past Friday, but they got the job done to remain undefeated. 16. Catholic Memorial (2-3; Last Week – 11) They’ve taken three losses to Top 10 teams this year, but the eye test would indicate that the Knights can play with anyone in the state. 17. Wachusett (5-0; Last Week – 17) No issues for the Mountaineers during a 35-8 pasting of Doherty, but we’ll truly see what this team is made of when they visit St. John’s (Shrewsbury) next Saturday. 18. Holliston (4-1; Last Week – 18) The Panthers offense erupted in a 51-32 win over Hopkinton, but giving up 30-plus points in consecutive games is not the calling card of this dynastic program. 19. North Attleborough (4-1; Last Week – 19) The Rocketeers continued to cruise since losing their season opener, as they dispatched Sharon 41-0 to win their fourth straight. 20. Marblehead (5-0; Last Week – 20) A dominant victory over rival Beverly gives the Magicians the inside track for a Northeastern Conference crown. 21. Grafton (5-0; Last Week – 23) The Indians pitched their second consecutive shutout in defeating regional power Northbridge, 7-0, to move to 5-0 on the season. Syracuse commit Ifeatu Melifonwu has, rightfully, garnered much of the hype on this Grafton team, mostly for efficient running of the ball, but the Indians are stacked on defense, and in the trenches as well. 22. Falmouth (5-0; Last Week – 22) It’s a true changing of the guard in the Atlantic Coast League. The Clippers already outlasted perennial power Marshfield in overtime and just demolished Dennis-Yarmouth 43-13 for their third conference win. 23. Shepherd Hill (2-3; Last Week – 24) Look out for the Rams. After dropping their first three decisions in the midst of protests and controversy, they’ve run all over their opponents while winning two straight, and running back Kevin Mensah has been granted an injunction to play out the season. 24. Hanover (5-0; Last Week – NA) Let’s give these Indians some love. They began the season by taking down tough opponents in Westwood and East Bridgewater, and just outlasted Scituate 42-34 to move to 5-0 on the season. 25. Natick (4-1; Last Week – 25) Following up their surprising win over Milton, the Redhawks easily handled Dedham this past Friday. Up next is another big conference test at Walpole.